Solving for a firm's profits under monopolistic and perfectly competitive conditions - FreeEconHelp.com, Learning Economics... Solved! 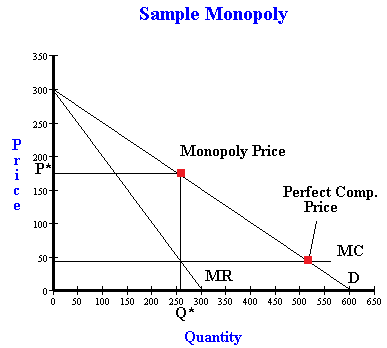 Here is another question recently received about mathematically solving for a firms equilibrium price, quantity, and profits under two different market structures: a monopoly, and perfect competition. 1. 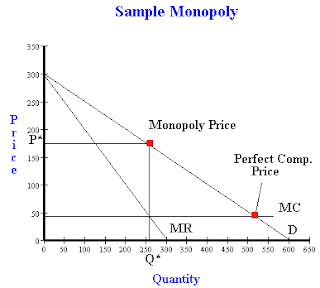 Assuming the firm operates as a monopolist, calculate the (i) price, (ii) quantity and (iii) profit. Graph and show the equilibrium price and quantity. profit? Show the equilibrium price and quantity on the same graph as 1. This type of problem is relatively straight forward. We are given a demand function, a marginal revenue function, and a total cost function. Remember that when maximizing profit we want to set marginal cost to marginal benefit (MC=MB) and in this particular problem, the MB is going to be MR (marginal revenue). So let’s figure out what marginal cost is going to be. If you know calculus, then you can just take the derivative of total cost with respect to Q. If you do not know calculus, then just find the slope of the total cost line. Either way you get a marginal cost of 45. Then you must set MC=MR so 45 = 300 –Q. Add Q to both sides, and subtract 45 from both sides to get Q = 255. Multiply our equilibrium P by equilibrium Q to get total revenue: 172.5*255 = 43,987.5. We can also plug our equilibrium quantity into the total cost function to get total cost. TC = 4,000 + 45 * 255 = 11,475. Total profit is going to be equal to total revenue minus total cost, so our total profit will be 43,987.5 – 11,475 = 32,512.5. So under perfect competition, equilibrium price is $45, and equilibrium quantity is 510. This makes sense, because our intuition tells us the perfectly competitive markets will provide products at a lower price, and also provide more of the good to the market.